"If you cannot use russet potatoes, go for the Maine potatoes." This is a very simple, tasty recipe. I used flounder instead of haddock and it would be good with most any fish. I also used cream in place of the milk, and it had a delicious, rich flavor. 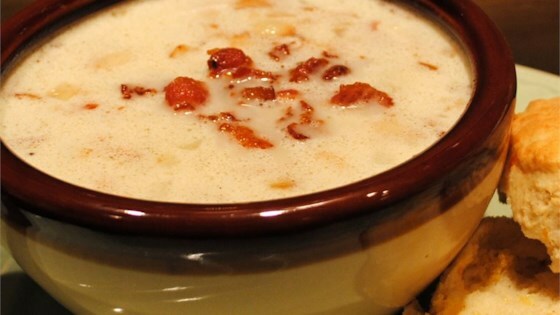 Very good fish chowder and easy to make. I did add some chicken broth instead of water to cook the potatoes in. I also added some cream instead of milk. I prepared this chowder for a church dinner for 75 people. It was a tremendous hit. Most people came back for seconds, a few for thirds. Easy to and quick to prepare. This meal was delicious. I have always wanted to make my own chowder. This was perfect. The next time I will put more fish in it though.